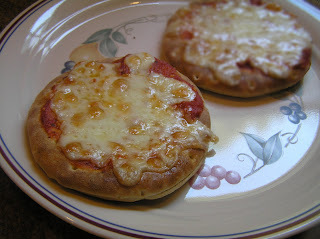 I used to make English muffin pizzas because they were quick and easy. And even though they need to be made in an oven (or a toaster oven to really help keep the kitchen cool), it was a very speedy 10-15 minutes from bag to table, which is almost nothing as long as the air conditioner holds up (did I mention the frosty 85 outisde?). Now I make 'em with these new-fangled thin sandwich thingies. Because they are thinner than English muffins. And more pizza-ish. This is another in my series of lazy easy summer foods. 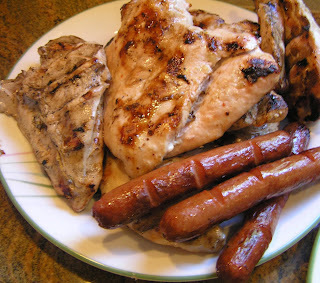 This past weekend I pretty much just slapped meat and veggies on the grill, cooked until charred (both me and the veggies, remember that the temps were in the 100s) then tossed everything on plates, "letting" youngerSon clean and set the table sometime in between. The veggies I picked up at the Wednesday farmer's market held a few feet from my library. I think the zucchini and eggplant must have been freshly picked about a minute before the truck left the farm, since they looked fresher than what was sold Sunday morning at the local Try 'n Save.